Julia Loggins was born in Hollywood, CA in March of 1955, and began the study of holistic medicine by saving her own life, after a childhood of life-threatening illness and disease, including asthma, rheumatoid arthritis, bleeding ulcers and blood sugar issues. Ms. Loggins embraced the world of regenerative medicine and the understanding of stress and toxicity as the source of illness and disease. She embarked on a living foods diet, wheatgrass therapy, juice fasting and other forms of detoxification. She studied for two years at the Hippocrates Health Institute, then in Boston, with Dr. Ann Wigmore, doctors Brian and AnnaMarie Clement and Viktoras Kulvinskas. She completed the Health Educator’s Course there in 1982. She studied with psychiatrist Dr. Ernest Pecci, whose work is now being carried on at the Hoffman Institute in Northern California, exploring the mind-body connection and the understanding of how family patterns affect health and well-being. In 1983, she became a certified colon therapist and opened a private practice in Santa Barbara, CA. .Having been told by doctors that she would never have children, and after having four miscarriages, Ms. Loggins studied with Niravi Payne, a pioneer in the field of the mind/body connection to fertility. Following her study, she gave birth to two healthy children, now 17 and 21, and became certified in Ms. Payne’s method. .Ms. 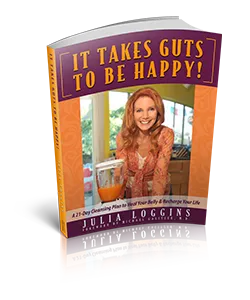 Loggins wrote her first book on health, Dare to Detoxify, in 2012, the culmination of over three decades of work in the holistic medical field, with a specialty in detoxification, digestive and autoimmune disease. She has a private practice in Santa Barbara, California, and lectures and teaches nationally. Ms. Loggins believes there can be no black-and-white thinking with regards to our health, focusing on a team-centered strategy for healing, aligning with both allopathic and alternative medical doctors and practitioners. The Mission of her work is to bring to people to the understanding that gut health is intrinsic to vitality and happiness; if the gut is happy, we are happy. This ultimate mission of her work is to teach the tools, concepts, and practices of gut health to every one who wants to experience the health and happiness that springs from vibrant energy.